When you think of a city on the water with a snow-capped volcanic peak in the distance what do you think of? I used to always think of Seattle and Mount Rainier. After moving to the PNW I quickly learned that the gateway to Rainier is not Seattle but rather Tacoma. Tacoma embodies everything that is Upper Left USA. Trendy up and coming bars, delicious breakfast joints that are open all day, waterfront sports, and an urban city full of young outdoor enthusiasts rocking fedoras and Danner boots. A few weeks ago I had the chance to explore Tacoma and Pierce County with the Tacoma South Sound Sports Commission on a three day adventure highlighting all things #MountainCitySea. I'm sharing our day-by-day adventures to help inspire your next trip to Washington. Our group met at Hotel Murano in downtown Tacoma for a quick meet and greet before heading out for dinner and an evening boat cruise. Hotel Murano is named after the Italian coastal town, Murano, that has long been considered the "Old World" capital of glass art. Each floor of the hotel has an exhibit devoted to a single glass artist, totaling forty-five artists from twelve different countries. Arts and culture are a staple in Tacoma and any art enthusiast will greatly appreciate the design and layout of Hotel Murano. After a short drive we found ourselves in Gig Harbor, a quant little maritime village about 15 minutes from downtown Tacoma. We started with an incredible sea food dinner on the water at Anthony's and then headed down to the docks for an evening cruise with local resident and owner of Destiny Harbor Tours, Tom. Unfortunately true to the PNW we had grey skies and no sunset but the waters were calm and scenery was still stunning. As a local, Tom is very well informed about the local wildlife history and ecology. On his tours guests have the opportunity to see Gig Harbor, Narrows Bridges, Salmon Beach, Point Defiance, Old Town Tacoma, Thea Foss Waterway, Port of Tacoma, Brown’s Point, and Vashon Island. A trip to Washington is not complete without views of Mount Rainier. When visiting Tacoma or Pierce County you don't have to settle for just a view of the mountain - Mount Rainier National Park is just 60 minutes from downtown Tacoma making it an easy day trip for weekend warriors and visitors alike. We had a delicious breakfast at the Bite at Hotel Murano and then loaded up the car and headed to Crystal Mountain Resort. After a quick check-in to our rooms we took the Mt. Rainier Gondola to the top of Crystal Mountain. The Mt. Rainier Gondola climbs 2,000 vertical feet welcoming you to incredible views of Mt. Rainier and the Cascade Range. 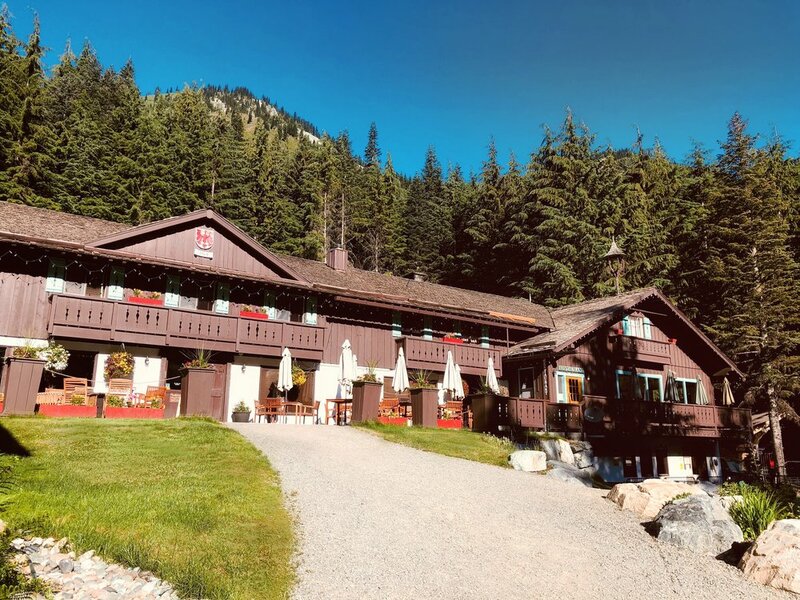 Slingback chairs and a high mountain restaurant (the highest in Washington state) with views of winding trails, wildflowers, and never-ending forests create for the perfect mountain setting. After lunch and beers at the Summit House we decided to opt for a hike back down to the bottom instead of taking the gondola so we could take in some more exploring. There are many different trail options from the summit of Crystal Mountain, varying from 1.5 miles to 6 miles, and all are welcome to leashed dogs. Hiking in the sun sure can make one thirsty and there are few things better than a beer after a long day. After returning to the base of Crystal Mountain we all gathered at the The Snorting Elk Cellar for some cold ones and beer snacks. The Snorting Elk sits below the Bavarian style hotel, the Alpine Inn. The Snorting Elk has 18 beers on taps, along with plenty of cold weather drinks to warm you up after a day of skiing. Our day ended with a casual fire pit dinner at the Naches Bar and Grill, know locally as the Chez. Naches is just down the road from Crystal Mountain in the small little town of Greenwater. With homestyle cooking and a friendly staff Naches is the perfect place to stop when you're coming or going to the mountain. Our last day in Pierce County truly embodied everything that the area has to offer. We started our day bright and early, leaving Crystal Mountain at 3:30am to head to the Sunrise area at Mount Rainier National Park for some early morning mountain views. Sunrise sits at 6,400 feet and is the highest point that can be reached by car in the park. There are excellent trails that start from the parking lot and several points at Sunrise offer visitors 360-degree views of the Mount Rainier and the surrounding Cascade Range. After returning from our sunrise excursion we headed to brunch at the Alpine Inn followed by mountain side yoga at the base of Crystal Mountain. The sun was shinning down on us as our wonderful teacher lead a large group through downward dogs and sun salutations. After yoga we hit the road heading back into Tacoma for some stand up paddle boarding along the Thea Foss Waterway. It was the perfect way to end a whirlwind trip around Pierce County! One of the things I love most about Tacoma is how accessible everything is and how much the locals care about their community. The Tacoma City Council passed the Bring Your Own Bag (BYOB) ordinance in July 2016, cutting the amount of thin plastic bags that pollute the area. Tacoma is also a bronze level Bicycle Friendly Community, awarded by the League of American Bicyclists, with nearly 65 miles of dedicated bikeways for bicyclists. Next time you are visiting Washington state I highly recommend making a trip to Pierce Country part of your itinerary, I promise you won't regret it! This post was sponsored by the Tacoma South Sound Sports Commission.